This project owes something in its concept at least, to Paul Gower. I have often admired his work, and in my humble, personal opinion, he is one of the top designer/makers in this country. As I said, the concept behind this table came from a project of Paul's in an earlier F&C article in issue 53 - I think it was the first time he wrote for the magazine. Paul designed and made a dining table with two sets of three legs - this is what gave me the idea; from here on, it is all my own work. When I first came up with the idea, it seemed very simple and straightforward. One of the problems with being a full-time editor is that getting into the workshop to make anything at all meaningful, is quite difficult. So anything you do make has to be fairly achievable within the working cycle of an issue, or has to be made months in advance. So when this piece was on the back of the envelope stage, it all seemed fine - perfect in fact - and interesting but, I hoped, fairly easy to make. In principle it is too - in practice it is a little harder - but we all relish a challenge, don't we? 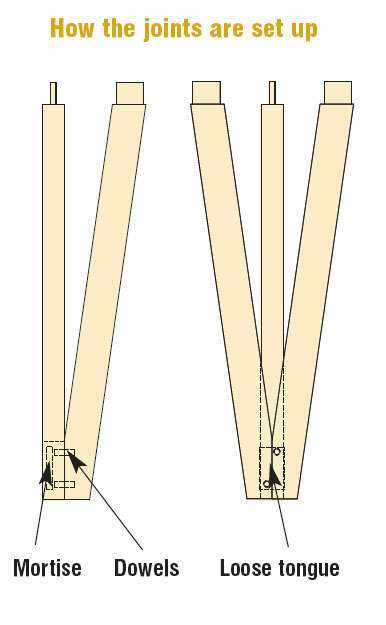 As you can see from the drawing, the idea is simple enough: three tripod type legs tenoned directly into the top. I liked the triangulation of the legs - in construction terms it should be strong and visually interesting. I also liked the V intersected by the third piece on each leg, as well as the decorative effect of the through tenons - wedged of course, with a contrasting wood coming through the top. I had one reservation about using through tenons and that was to do with the grain direction. Because the three tenons of the leg pieces are in different positions, the wedges would spread them in some cases with the grain, which is of course a no-no! In my recent article on through tenons, I discussed diagonal wedges, which spread less and dispersed the pressure across a wider area. 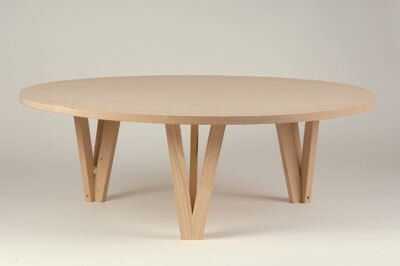 This is what I opted for - it also fitted in nicely with the angles of the legs. The only fly in the ointment was how to connect the three pieces that formed each leg. In trying to keep everything reasonably light, so as not to look too visually heavy, it did mean that there was not a lot of material for any kind of mechanical joint. 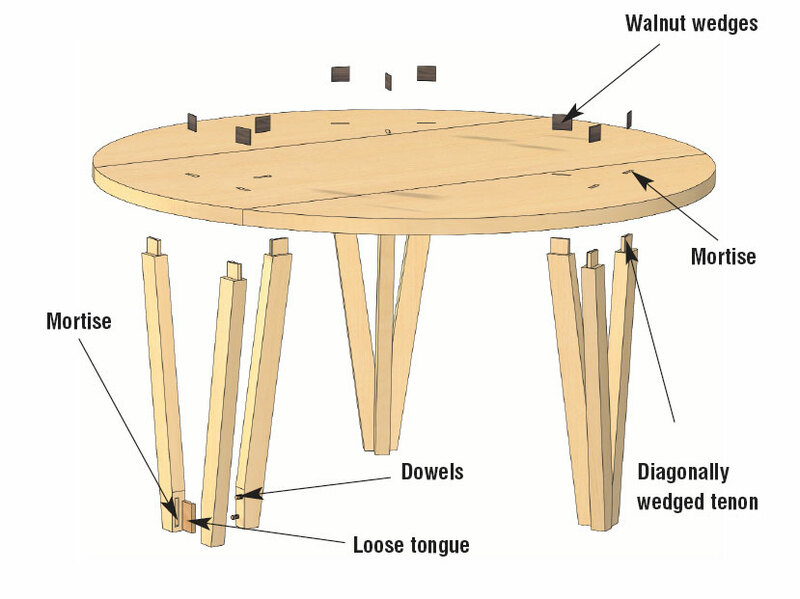 The main V of each leg is not such a problem - a loose plywood tongue is plenty strong enough. The problem came in connecting that third intersecting piece - an integral part of the design in both visual and structural senses. On the one hand, it makes the whole thing work and on the other, it provides great strength through triangulation, which ties it all together. Another loose tongue would just eat away the joint of the first part. In the end I decided on dowels. Even these, as you can see, come pretty close to the joint line. 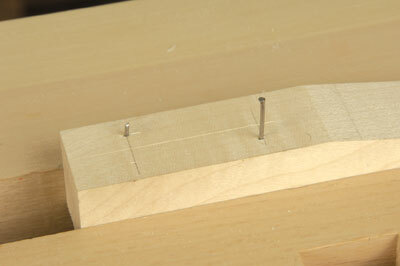 However once all three components of each leg are glued up, it is very strong, particularly once tied into the top. So all my worries sorted, it was time to make the table! I found some lovely sycamore for the top and legs, nothing like making the job more difficult. Jointing was going to have to be extra crisp in a pale white wood. It would look equally good in cherry I think - English or American. Zebrano would look very striking for this piece and was my original preference, but I could not find any in time. I made a full size mock up - just to see if my idea would actually work! Just using some scrap pieces of MDF and pine, I cut and glued each leg with just a rub joint and screwed each tripod into an MDF top. Solid as a rock! Start by making a template of the leg pieces. This makes life easier by giving you an actual shape to get your head round. It also has all the angles on it, so is a mini rod. 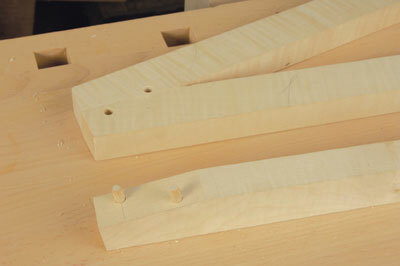 Two of the angles involved are the same, so these can be set up on a mitre guide on a saw. Once you have your template, cut out all nine leg pieces, marking off exact lengths from your template. 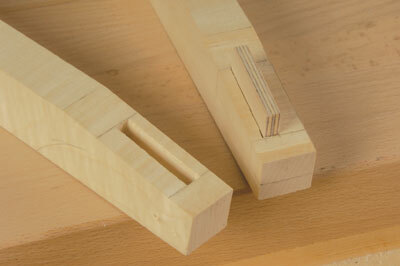 Remember to allow extra for the thickness of your top and the tenons to come through the top and be cleaned off. Once you have all nine pieces dimensioned, the next job is the faces of the main V joint. These I marked off the template, cut on a bandsaw and planed up with a jackplane. For some reason, I decided to do all the jointing by hand. I could have easily cut all six mortises for the tongues with a router. Instead I drilled out the waste with a pillar drill and cleaned them up by hand. It just seemed a good thing to do and was very therapeutic. The angle bisecting the main V makes it very easy to set up; simply mount it face flush with a drill press vice. Once all six mortises are ready, fit the ply loose tongues. These can be cut to near size on a bandsaw and then planed to a good fit on a shooting board. 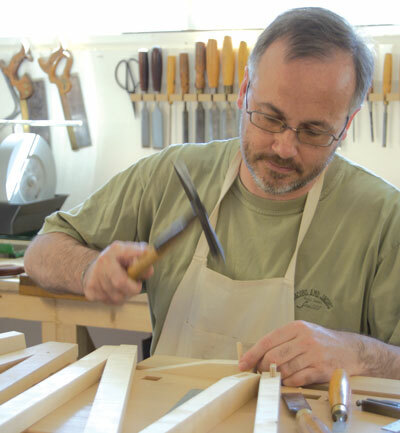 Unlike a conventional table where you could glue up the ends prior to the rest of the piece, the nature of marking out the top through tenons means all the joints have to be cut before any kind of assembly. 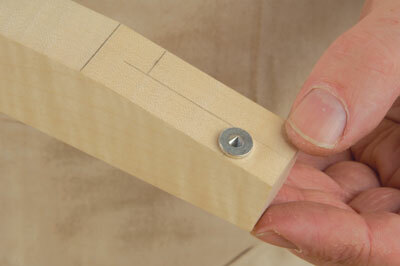 The dowels that give mechanical strength to the middle struts of each are again drilled on a pillar drill. There are commercial jigs available but they are probably too big for these pieces. There are a couple of ways you can mark these out. In my old workshop we used cut off panel pins. Mark out a centre line with a gauge, and then knife the position you want them in. Tap in a panel pin on the cross of each position. Use something like a blade or a square, or any material with a uniform thickness, about 3mm (1/8in) thick. 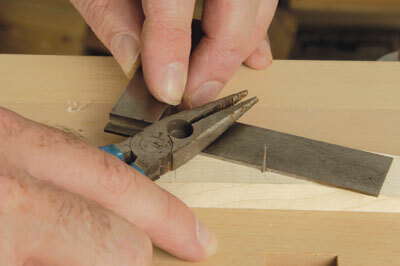 Place alongside each pin, and using snips or pliers, trim off each pin using the blade as a height guide. Now carefully mate this to the other two pieces, holding them tightly together as you do it. You will now have two corresponding marks. The other way would be to pre-drill a small block with a locating piece and use this. You couldn't drill too many like this as it would wear, but for this amount of holes, it would be fine. An alternative method would be to use dowel points, but I had great difficultly getting hold of any - it seems it is old technology these days. Once drilled they do look a touch on the dangerous side of fragile, but do not worry; it will hold together! As I said before, once the joints are all glued up and the top tenons are tied in, triangulation will make it very strong. This is where mock-ups prove their mettle. "Jointing was going to have to be extra crisp in a pale white wood"